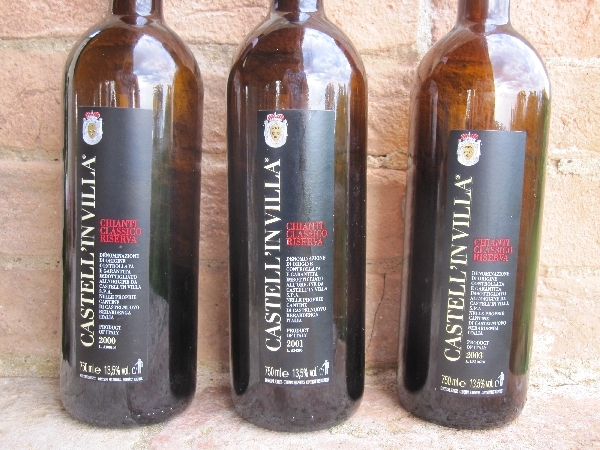 The Greek-born (Princess) Coralia married into the noble Pignatelli family and together, she and her husband bought the The Castell’in Villa estate (more like a «village», hence the name) in 1969 and produced first vintage was the 1971. The vineyards cover a mere 54 ha of her vast estate and produce between 80,000-100,000 bottles per year, which is not much. In total, the Castel’in Villa estate encompasses about 300 ha on which she produces wine, a very nice olive oil, runs a charming agriturismo, and a great restaurant. 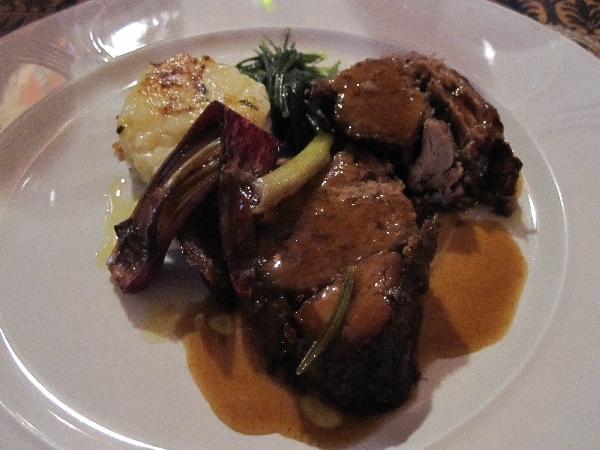 The restaurant makes all the food fresh on site, and many of the ingredients are sourced locally, like the herbs, wild pig and the pheasant. Coralia is also an appreciator of eclectic art and some unusual sculptures can be seen on her property. Although she is approaching 75 years of age, he demeanor and looks deceive that age, as she socializes with a glass of wine with you until late into the evening. Always poised and elegant yet never arrogant. A certain sense of calm emanates from her that is both charming and contagious. 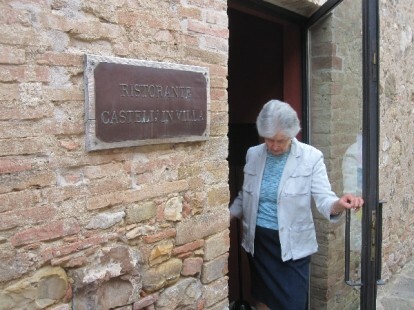 Castell’in Villa work very traditionally both in the vineyards and in the cellar and her vineyards are very much alive with wild pigs and pheasants (which you can hear quite clearly throughout the day & night). The wines ferment spontaneously, except in extreme vintages where a neutral yeast might be added to commence fermentation. If I heard correctly, they have only had to induce fermentation once in the most recent years. Maturation in large Slovenian botti give these Chianti’s a very traditional feel even though they are 100% Sangiovese, which until recently was not allowed under the legislation. It was customary to blend in some other local red grapes and even some white grapes. I would like to note that I overheard Coralia saying she had just purchased some new French botti so it will be interesting to see how this affects the future vintages. 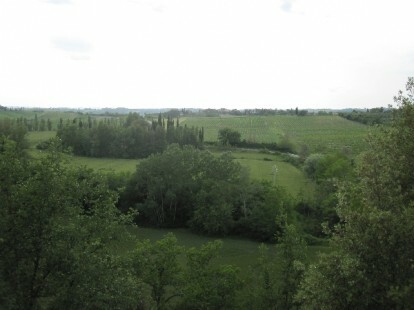 2006 Chianti Classico Riserva – (not yet for sale) Tight and a bit closed. Very serious. Concentrated and young and one of the only wines I tasted that showed hints of dark fruit. Rough and young tannins. Hints of spice. Yet remaining fresh. Really a storage wine. 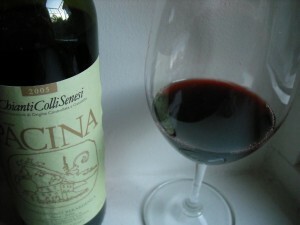 2003 Chianti Classico Riserva – very open, but at first appearing a bit overripe and representative of the 2003 warm vintage. Only 10 min in the glass and the wine opened to reveal bright red fruit and spice with hints of smoke. Nicely integrated oak. Became very fresh and drinkable with very refreshing acidity. I enjoyed this vintage tremendously. 2001 Chianti Classico Riserva – A more classic & reserved nose with less development snowing than the ’03 even though it was two years older. Less raspberry and more cherries. More classic and typical Italian nose. A youthful nose with hints of balsamic evolution. Roses and rose hips. On the palate, cherries and cherry pips. More restrained than the ’03 yet more structured and serious at the same time. Surprisingly young considering it’s 10+ years. Nicely integrated oak. More tannic also than the ’03. In my opinion this wine needs 8-10 more years to really show its stuff. The ’03 is more drinkable and refreshing and easier to drink (quickly). 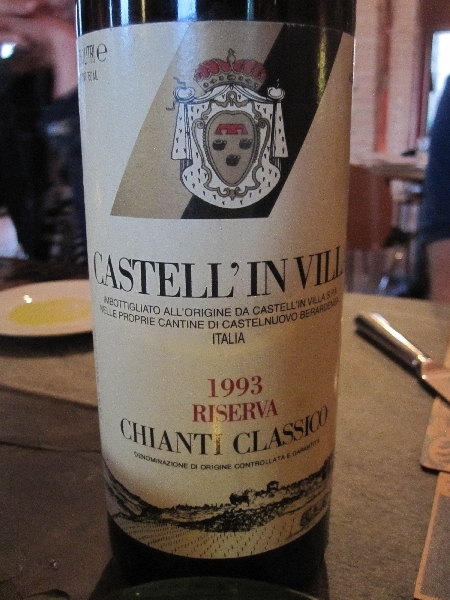 2000 Chianti Classico Riserva – another warm vintage. Nose – more serious again then the ’03 but showing more evolution than the ’01. Mineral with cherries. Feels more mineral than ’01. Very open and floral with hints of balsamic, but only hints. Feels a bit more alcoholic than the other two vintages. Fresh but somehow a bit more austere than the previous two. The alcohol sits a bit in the back of the throat. Some nutty hints on the nose, which I don’t mind. Not as fresh as the others with some acidity which pokes a bit making it a bit more challenging to drink on it’s own. The least drinkable so far. Not sure this wine has potential to improve in the cellar. It seems the fruit is more evolved than the structure. Medium tannins. Spiky, edgy and not so balanced in my opinion. 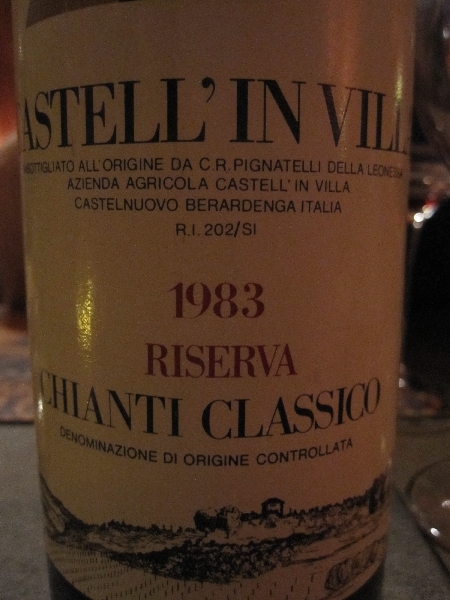 1983 Chianti Classico Riserva – surprisingly quite closed initially. Very timid on the nose. Balsamic notes. As it opens, it feels more serious and sure of himself even than the 1993. Hints of licorice. 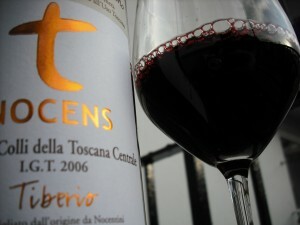 On the palate the wine is quite open and focused with sweet tannins and fresh acidity. More herbaceous and spicy than the 1993. Sweet ripe fruit, raisins. Still very focused with really sweet fruit. Honestly, still a young wine with many years to go. 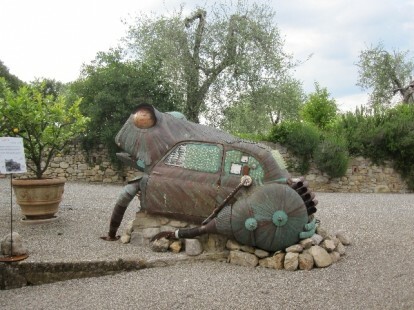 2008 Chianti Classico – fresh and expressive. Sour cherries, refreshing and light. Long with medium tannins. Good alcohol integration. The nose is wide open. Fresh and vibrant. Long. 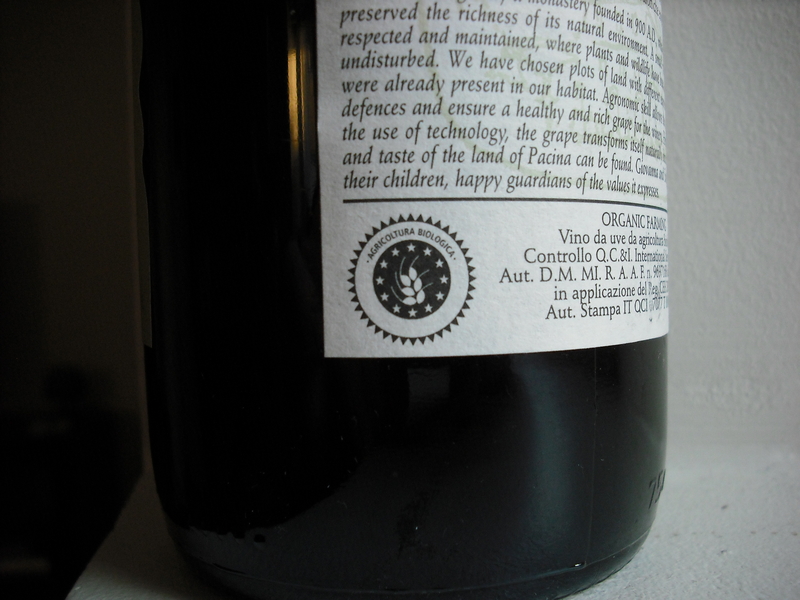 2008 Chianti Classico Riserva Poggio Delle Rose – Some dark fruits. Very structured and oak is a bit evident, but not dominant. Darker fruits then the other wines. 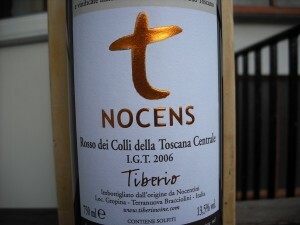 Stronger tannins from both the fruit and wood. A bit earthier than the others, you can taste the soil in the wine. Summed up, this wine has fantastic fruit and concentration. However, not my style of wine. Appearance: Clean. Medium dark red with hints of blue. Medium to medium low intensity. Nose: Clean. Medium intense nose of dark cherries and wild black currants with hints of cedar and eucalyptus. Medium complex wine with well-integrated oak on the back end. Overall impressions: This is a well-made wine with good structure, balance and clean fruit which should be a pretty good wine to match with food. I am thinking a grilled steak, or grilled vegetables would be a nice complement to this wine. This being said, the oak is too dominant for my palate, but I feel that many people will enjoy this wine. It sits nicely between a modern-made wine and one made traditionally. In my opinion, this wine can be stored for a few more years, but I don’t think that it will improve so I would drink it now. I have tasted other Tiberio wines and find his fruit to be clean, precise and on the feminine side (especially his Sangiovese, my favorite of his wines) and I feel that his wines would be better represented if they weren’t stored in oak. For those of you who share my feelings on this, rumor has it that he is playing with some un-oaked versions of his wines as I write this and perhaps I will have the opportunity some day soon to taste as stainless steel version of his Sangiovese. I have tasted a few Chianti’s from the Colli Senesi DOCG and they are often fresh and light. 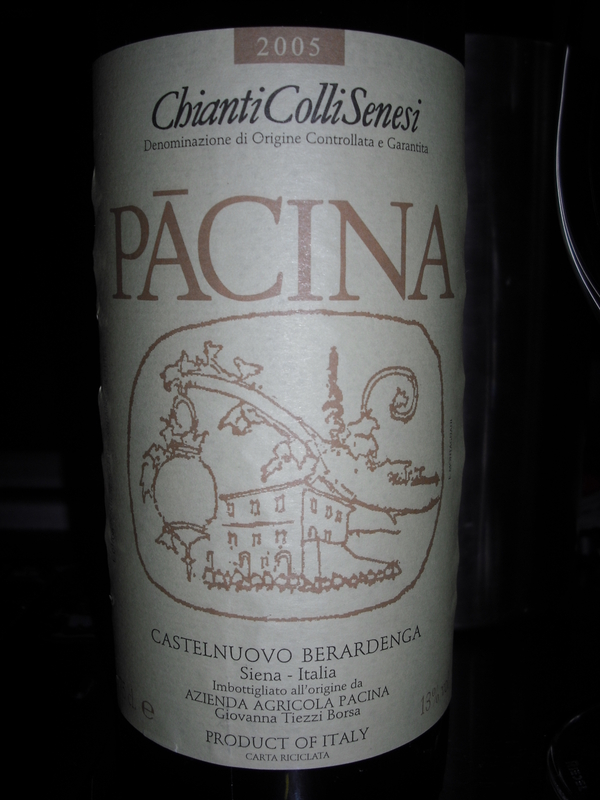 This wine seemed more like a Brunello di Montalicino than a Chianti or Chianti Colli Senesi. With some digging I found out that Azienda Agricola Pacina is located in Castelnuovo Berardenga, but his vines are in the Colli Senesi DOCG (which I am told you can see from the kitchen window). I should also add that on a clear day, you can see Montalcino from the estate (home of the afore mentioned Brunello di Montalcino), which could be part of the reason why this wine was more like a Brunello to me. The 10ha vineyard for this wine is made up of sand, clay and oyster fossils and is farmed organically, leaning towards biodynamics. 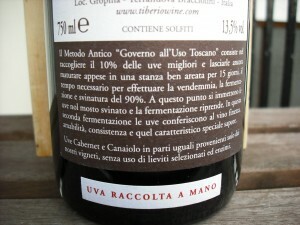 The blend is 97% Sangiovese and 3% Canaiolo/Ciliegiolo. The grapes are hand harvested, crushed and the alcoholic fermentation takes place utilizing indigenous yeasts. The wine is left to macerate for around five weeks in concrete tanks (the long skin contact could be another reason why this wine resembled a Brunello). The wine is then aged for one year in (5-10 year-old) 500 liter barrels and botti of 17-25hl. 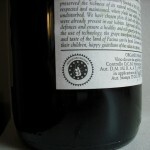 The wine is then bottled without clarification nor filtration. Very little sulfur is added at this time ( I’m told 15-20 mg) and aged a further 6 months before release. 25,000 bottles are produced. Alcohol: 13.2% Total Acidity: 5.5%. Price in Norwegian Kroner is 200 ($31). Appearance: Dark brick-red with good color depth. Medium intensity. Still nice dark edge suggesting that this wine is younger than it really is. Nose: When first opened, slight hints of onion, suggesting that there was slight reduction. This very quickly burned off. Hints of mineral emerged along with dark cherries and dark plums. Hints of herbs like rosemary. Some dried fruit notes on the back end. 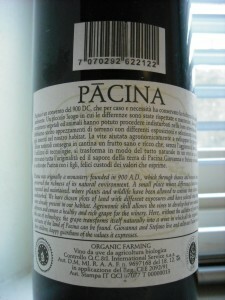 Palate: Dark cherries and cherry pits. Medium plus acidity and medium plus tannins which actually increased and began to over power the wine a bit once in the glass for 10 minutes. It was difficult to distinguish weather the tannins were coming from the fruit or the 500 liter barrels. I am quite sure that most of the tannic structure of the wine came form the fruit itself. Very rustic style of wine with secondary aromas that emerge about 10 seconds after the initial impression on the palate. Those secondary aromas sat for 30 plus seconds. 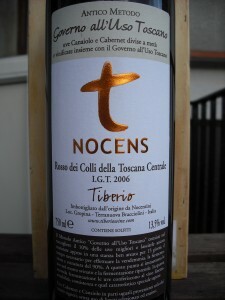 I tasted this wine again on the 19th of May, after the bottle had been open for 3 days and stored in the refrigerator. It had actually improved considerably. The tannins were better integrated and the fruit more precise. It’s my opinion that this wine is a wine that could benefit from 5-7 years of cellaring. A reliable source reported to me that he had recently tasted a 1995 and that it was, to quote him directly “fantastic”! I suppose that at this price, one might expect that a wine with the Chianti Colli Senesi DOCG can be aged.